Taste test: These are wide-rippled chips with a good crunch and a generous helping of tasty cheddar and sour cream seasoning. They're very tasty and good, and the bag emptied quickly after being placed in the chip. Smell test: An OK sour cream and cheddar sort of smell. 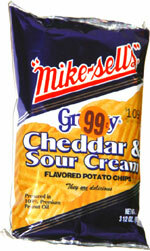 This snack was discovered by Jeremy at Shell station in Indianapolis. Review published .